What loan types does the software handle? CLA works with all types of consumer loans: Unsecured installment loans, new and used/direct and indirect car loans, second mortgage and other home improvement loans, overdrafts/lines of credit, HELOCs, credit cards, and so forth. Each such loan type is handled by the system as a separate portfolio, so that its expected loss and other analytics are based solely on your experience with that particular loan type. At present, because of their very different statistical and other characteristics, CLA does not support commercial lending (other than those member business loans that are, as a practical matter, consumer-type loans), and it does not support long-term first mortgage loans. Are there any limits on the size of the portfolios CLA can handle. For statistical reasons, CLA’s ability to produce granular and accurate analytics down to smaller sub-portfolios requires about 1,200 loans in the overall portfolio as a minimum. However, the system delivers nearly instant on-demand reports and analytics screens on portfolios of 100,000 loans or more. Utility is enhanced if large portfolios are divided into smaller ones that share similar characteristics (e.g. term or amount ranges). 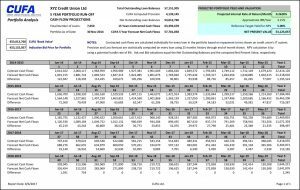 How does CUFA Lending Analytics (CLA) calculate expected losses for non-delinquent loans? The new international accounting standards (IFRS 9, CECL, FRS 102), as well as best practice, require lenders to calculate the degree to which up-to-date loans are expected to produce losses. Even with effective underwriting, individual consumer loans go bad for reasons that were basically unpredictable when each loan was made (e.g. subsequent loss of job, marital problems, health issues, etc.). But expected bad debt can be mathematically predicted from each lender’s own historical experience. Hence, statistically predictive, ‘big data’ software like CLA is the only practical way to compute the expected losses already imbedded in the performing (and delinquent) loans in a large portfolio. 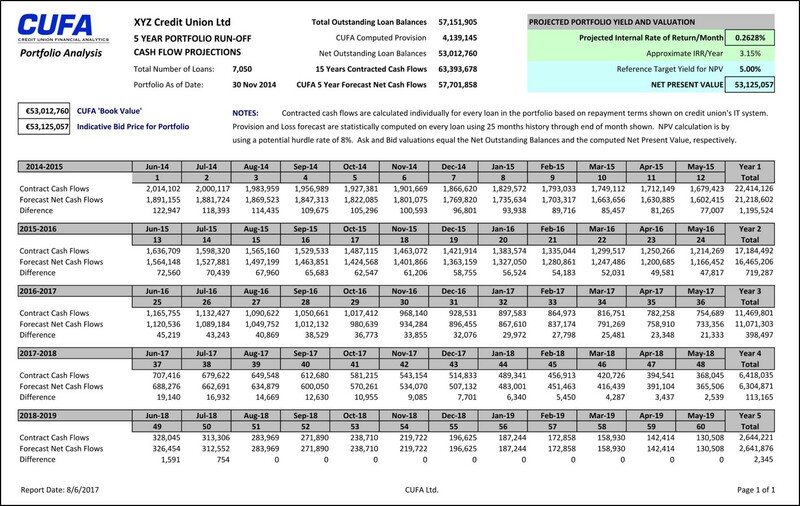 The CUFA software employs statistical algorithms that back-allocate expected net losses to both currently performing and delinquent loans based on the unique rate at which each portfolio has historically progressed back and forth into delinquency and, for some loans, into write-off. 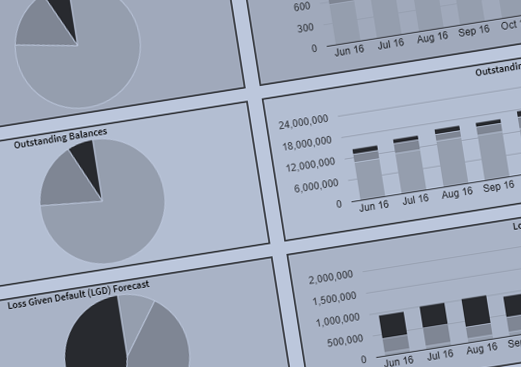 How does CUFA Lending Analytics compute loss given default (LGD)? CLA’s calculations are informed by each lender’s historical experience in collecting post-write-off recoveries, going back at least two years. Hence, CLA forecasts LGD based on the lender’s actual recovery skills. Can CLA be used on a one-off basis for portfolio valuations and mergers? Absolutely. CUFA offers a special pricing plan for a pair of credit unions who need to obtain objective valuations of their respective loan portfolios in order to inform merger negotiations. We also have provided clients with cash flow projections and valuations for portfolios they are evaluating for purchase. Our fee is a fraction of the cost of engaging accounting firms to perform a manual valuation, and CLA provides the additional advantage of valuing two portfolios on an entirely non-subjective basis, using an identical ‘standard ruler’ to measure the value of each. How current is the information provided by CUFA Lending Analytics? CLA is updated after each month-end by means of a data feed from the credit union’s core IT system or data warehouse. New data is loaded as soon as it is uploaded to CUFA, at which point the system refreshes all its expected loss calculations automatically, so that analytics screens and reports are then immediately available to each user. Can the System calculate progression into loss rates over various periods of time? Yes. By running alternative analyses for any sub-portfolio you define, the system will instantly re-compute progression rates and expected losses over any date range you specify between 1 and 12 months. That means you can see immediately how expected losses have trended, either as a rolling average over the past year or as narrowed down by you to capture the near-term effect of recent events (e.g. an unexpected economic collapse, a strike or company failure that impacts a subset of your borrowers, etc.). How do the System’s forecasts stack up to actual experience? 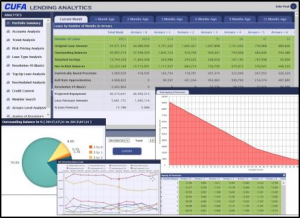 Expected loss forecasts from CUFA Lending Analytics are accepted by leading audit firms because CLA efficiently calculates outputs that are statistically equivalent to what is otherwise only available from labor intensive manual loan file reviews and spreadsheet-based analytics. CLA automates in minutes an IFRS 9 / CECL / FRS102 compliant loan book review process that would otherwise require days to perform at substantial expense. CUFA has ‘back-tested’ its software’s forecasts and found that they come very close to actual experience. Of course, like any prediction of the future, there can be no guarantee of absolute accuracy. Is CLA only a loan provisioning tool? No, for sure. In fact, the primary value of CUFA Lending Analytics to its current users comes from CLA’s ability to inform all of their analytics of loan performance in light of the software’s calculation of the probability of default for every loan. See how characteristics such as collateral value and the borrower’s credit score have trended since the loan was made, etc. etc. How much does CUFA Lending Analytics cost? Much less than a single bad loan each year. A quote for your organization will be supplied upon request. How long does it take to install CUFA Lending Analytics? It normally takes less than a week to install the lender’s data and provide initial training. Depending on your IT provider or data warehouse capabilities, the whole process can require as little as two or three days. Then you are ready to go.